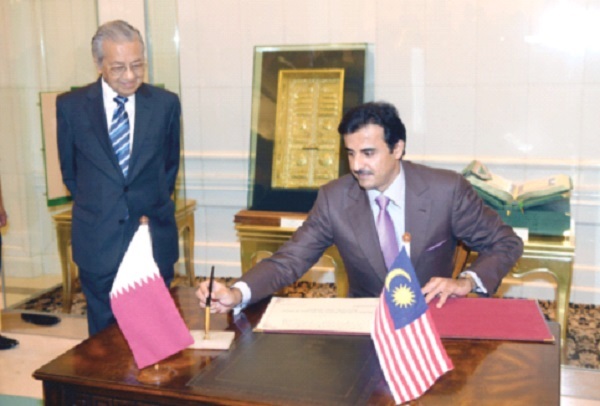 Tun M hosts luncheon for Qatar Emir | Daily Express Online, Sabah, Malaysia. Putra Jaya: Prime Minister Tun Dr Mahathir Mohamad Thursday hosted an official luncheon to honour the visiting Emir of Qatar Sheikh Tamim Hamad Al-Thani at Seri Perdana here. The Qatar Ruler, who arrived in Malaysia Wednesday for a three-day working visit, was greeted by Dr Mahathir upon arrival at the Prime Minister's official residence. He later signed the official guest book at the Protocol Gallery. Foreign Minister Datuk Saifuddin Abdullah; Minister in the Prime Minister's Department Datuk Dr Mujahid Yusof Rawa; International Trade and Industry Minister Datuk Darell Leiking; National Centre for Governance, Integrity and Anti-Corruption (GIACC) director-general Tan Sri Abu Kassim Mohamed also attended the luncheon. Dr Mahathir and Sheikh Tamim earlier held talks at Perdana Putra. The Foreign Ministry (Wisma Putra) in a statement said the visit marked the first official meeting between Sheikh Tamim and Dr Mahathir since the change of Malaysian leadership in May this year. It said the visit would provide an excellent opportunity for both leaders to discuss bilateral matters, as well as exchange views on a range of international issues of common concern and mutual interests.